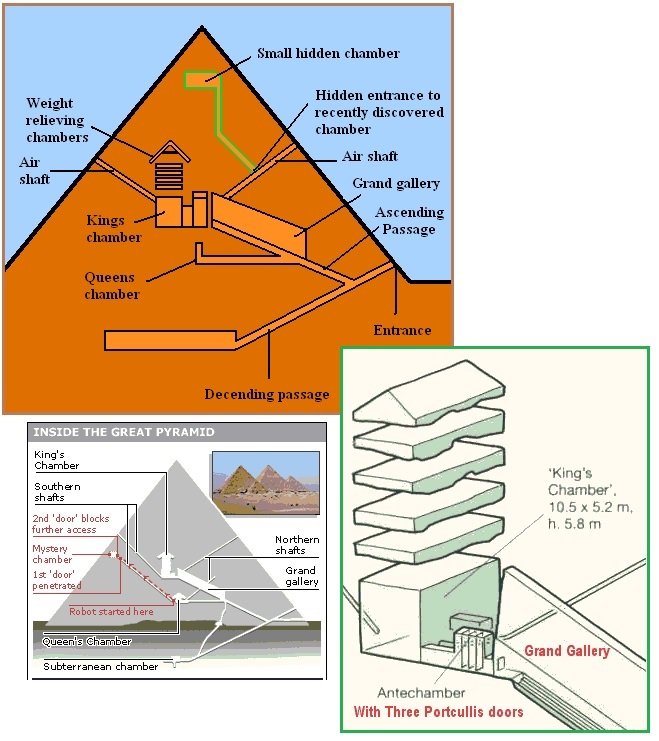 Early in the ZetaTalk saga the Zetas were asked about the hidden chamber in the Great Pyramids, which had no entry or exit except for a long shaft so small only a rat could crawl through it. The shaft was at an angle. The Zetas stated this was a sighting device, to announce when the home planet of the Annunaki, Niburu, was inbound from the direction of the constellation Orion. All types of rumors abound about the Great Pyramids, some true, some false. It is known that a hidden chamber exists, accessible only via a tunnel so narrow that it might be traveled by a rat, yet so straight and long that it could only have been used for sighting. The chamber lies empty now, a center platform formed like a shallow basin without whatever object was intended. What went on there, and how did the object disappear through the long narrow tunnel? Hypothesis are that there is a back door to this room, as yet unfound, whereby an occupant or object could escape. This hypothesis has the room acting as a tomb or worst case scenario of an isolation chamber, or if not for a human or alien occupant, holding a massive crystal. None of these are true, as the room has no other entry and was never intended to hold a solid object. The occupant was a liquid, pooled in the shallow basin and reflecting light outward only when light shown down the long tunnel at that particular angle - the light from the approaching Nibiru. Various other sighting tunnels, as yet undiscovered, caught the reflected light. The liquid, of course, evaporated over time, leaving only the puzzle behind. The Great Pyramids were built essentially as Navigational Devices. The Great Pyramids, by their great size and weight, ensure stability. All this just to sight an incoming comet, which makes its appearance on a regular basis and can be seen weeks if not months beforehand? The Great Pyramids were not used solely for sighting an incoming object, as their primary purpose was to act as a guidance system for the launches the exiled Nibiru residents would make to meet their home planet. This required precision, as their rockets were no more sophisticated than those used to boost man into space today, and once in space they simply coasted until drawn into the gravitational orbit of the water planet they owed their allegiance to. Many pole shifts have occurred since they were built, each time the crust of the Earth sliding into new positions. One would have to calibrate anew the points, which would in any case not now converge to the point where the giant comet reenters your Solar System. Legend has it that the Giant Pyramids originally pointed near the Orion Star System, and those legends have carried true to their origin. Where this is the original point convergence, the spot where the giant comet first looms into view, the Giant Pyramids no longer act as a guide in this matter. We have mentioned that the Great Pyramids were a sighting devise, such that the light from the approaching 12th Planet would flood down a narrow passage and reflect off a pool of liquid, an unmistakable signal to those nervously watching and needing to synchronize their shuttle paths to their traveling home. The secret chambers and long diagonal tunnels had been explored by robots, but there seemed to be no explanation for this design. The Zetas stated in 1995 that these were sighting tunnels and liquid mercury was in a pool at the end of the tunnels, to reflect the red light coming from the inbound Nibiru. In 2015 this liquid mercury was found in several Annunaki pyramids in the Americas. Several robots (including Gantenbrink) were specially designed to try to reveal the secrets of the pyramid impenetrable, many abortive projects (including several NASA) for lack of permission from the Egyptian authorities, the latter being sent into him (last year) the robotic device designed at the University of Leeds in the United Kingdom called Djedi. (Referring to the wizard who mistakenly believes that advised construction Cheops pyramid) who was commissioned to explore the small tubes that cross the famous and intriguing Gantenbrink door and got unseen images: Strange. As far as we could "see" Cheops contains 4 narrow tunnels 20 feet wide by as many high, all with the same inclination of 40 °: 2 leave from the King's Chamber and 2 from the Queen's Chamber (whose axis had originally been intentionally concealed by the ancient Egyptians with stones, until the English Dixon discovered its existence). A large quantity of liquid mercury, sealed for nearly 1,800 years, has been discovered in a chamber under a pre-Aztec pyramid in Mexico's Teotihuacan city. The Mexican archaeologist who found the metal was hunting for a royal tomb in a deep, sacred tunnel beneath the pyramid. Gomez thinks the metal which was difficult to mine and rare in ancient times could have been used to symbolize an underworld river or lake. It has been uncovered in small amounts at a few Mayan sites further south, but not in Teotihuacan.